I just recently moved back into my house, and a lot’s changed since I was here. Perhaps the most notable difference is that home and work have combined. So, when it came time to configure my home office, I wanted to make sure I had everything I needed to adequately work and play in the same space while also keeping them sufficiently separate. Let’s talk needs. Two monitors is a minimum for work. Some people like a third display, but it’s give-or-take for me. I find that I’ll be looking at the far-left monitor and not notice something important that’s happening on the far-right. I’m not anti-third display; it’s just not something that I particularly care about. I like two displays for home for some of the same reasons. If I’m learning something, I want to have a page up on one screen while I work on the other. Or, maybe I want to poke away at some code while watching some TV. Either way, two screens makes life better. The old home office had my home and work computers in different rooms because I didn’t have a proper office, but it was time for them to unite. The MiniView is a cool piece of hardware. It’s got some decent weight to it, and the metal case and buttons look nice–essential for a desktop peripheral! I ran into some hiccups hooking everything up, but I think it may have been because I was hot-swapping everything instead of turning everything off like recommended in the user manual which, of course, was not read until after the fact. The functional shenanigans during setup caused the initial configuration to take the better part of 2 hours and was really frustrating. I was definitely feeling some buyer’s remorse and considering sending it back, but I got it working after a few reboots and do-overs. Okay, initial setup was done. Displays were working; keyboard was working; mouse was funky. I’d read some reviews about issues with wireless mice, so I wasn’t entirely surprised by this. I had a nice gaming mouse, so I decided to just roll with that, but I couldn’t do it. I missed my Logitech Performance MX and had to go back. Fortunately, the MiniView has a USB port to share a single peripheral between computers. I plugged my Logitech universal receiver into it, and the mouse worked just fine. Boom, problem solved. I was all done, or so I thought. I ran into another problem a day or two later, this time with the keyboard. The “t” got stuck, and even unplugging and re-plugging it in didn’t solve the issue. So, I grabbed a cheap 3-port USB hub that I had laying around, plugged it into the single shared port on the KVM, and plugged my mouse, keyboard, and wireless headphones receiver into it. Now I’m not using either of the KVM’s dedicated USB keyboard or mouse ports, but everything works perfectly. I lose out on the KVM-specific keyboard and mouse commands, but the KVM is front & center on my desk so I probably wouldn’t be learning or using those commands, anyway. Everything’s been good for another day or two at this point, and so far, so good. I’m feeling good about this configuration and hope it keeps working! Oh, and if you’re curious about the monitor/computer connections, my two monitors connect to the KVM via HDMI-to-DVI cables. Computer 1 is connected to the KVM using the KVM’s provided DVI+USB cable and a DVI-to-HDMI cable. Computer 2 uses the DVI+USB cable and an additional standard DVI cable. The third display connects to Computer 1 using a VGA cable (Computer 1 only supports 3 displays if one is VGA), Computer 2 using a standard HDMI cable, and the DVR using a standard HDMI cable. I’m generally keeping the third display disconnected from the computers (through their display control panels) and just using it as a TV, though. Previous PostUltimate Guide to Speeding Up ReSharper (and Visual Studio) – JetBrains .NET Tools Library – ConfluenceNext Postgit – How to list branches that contain a given commit? Dueltek Distribution Presented: DVI-D Double Attach display wire to utilize with all newer digital displays, projectors, and TFT/LCD Skate Panel Monitors. 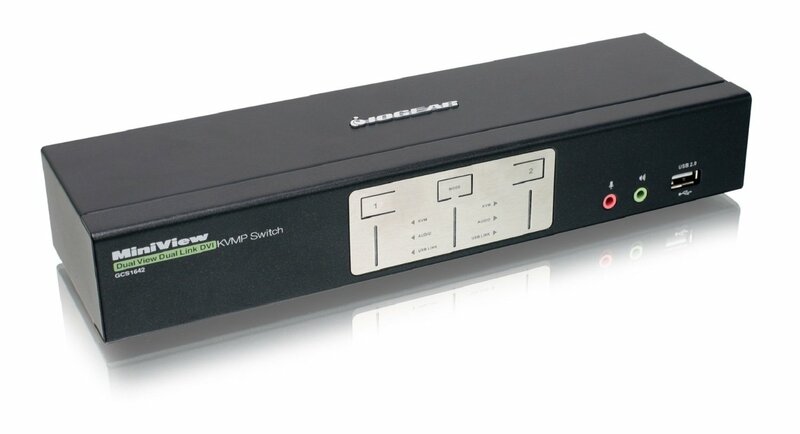 Double Attach digital network supports monitor resolutions of approximately 2560 x 1600. A couple of Connect support systems up WQXGA (2560 x 1600 @ 60hz with a bandwidth of 7.92 Gbit/s .